More than 80 million Americans turn to complementary and alternative medicine every year. What's more, the World Health Organization estimates that 80 percent of the world's population relies chiefly on traditional medicines - the majority of which are plant extracts-for their health care needs. With help from nutritionists and years of research and experience with her own birds, Cathy DeHaan the owner of Twin Beaks® Aviary has developed this Herb Salad™ to help remedy the fact that our captive birds are not able to self - medicate like birds in the wild. She has chosen only herbs that are organically certified and cultivated for human consumption. All 22 herbs in the mix have been tested, each individually, on hundreds of birds and chosen for their healing and preventative properties to target various functions, e.g. antibacterial, antiviral, antifungal, liver and kidney function, blood cleanser, digestion, fertility, immune system, respiratory, etc. Wheatgrass powder circulation, amino acids, enzymes, chlorophyll. Directions: Offer Herb Salad™ dry, in shallow dishes so that your birds can pick around and find the particular herb it needs. When I placed the herb mix in my flights, they didn't touch the dish for three days. The fourth morning the dish was picked clean! This tells me that the birds were missing something in their diet that I never saw signs of! Replenish as necessary or every two weeks. Can I mix your herbs in with my egg food? We don't advise mixing Herb Salad™ in with egg food, soak seed or anything moist. Because of the medicinal properties of the herbs, your birds should be able to choose which herb it wants and the quantity it desires to eat. Will I have to grind up your herbs for my smaller birds? No. This would make it very difficult for your bird to pick out certain herbs. Also, birds generally don't prefer powdered mixes. Can I feed Herb Salad™ to my parrot? Certainly! All species of birds will enjoy the benefits of Twin Beaks® Aviary's Herb Salad™! I was just wondering how long the herbs will stay fresh and how to store them. I have an African Grey coming to live with us in Aug. (after being weaned) and don't know how much to order or how to feed it. Keeping opened Herb Salad™ sealed and dry will retain optimum potency and freshness for 1 year. Unopened, it has a shelf life of up to 2 years. While refrigeration is not necessary, storing at a low temperature or freezing unused portions may extend the expiration threshold. Young parrots seem to take instantly to Herb Salad™, some need to *learn* what it is.. Provide a cup large enough to contain a well mixed blend, but try to locate it in an area of his cage away from his food and water sources so that it stays clean. Are the herbs in your Herb Salad™ mixed in equal parts? No, quantities are varied according to diet requirements. The selection and proportions of herbs contained in our blend has been carefully chosen based on extensive research and many years of use. It looks like my birds are *playing* with some of the herbs?! They're extracting nutrients by *mouthing* or *playing* with certain herbs, especially the larger pieces. Can my birds eat too much herbs and get sick? No, your bird knows best what it needs and how much. I don't know if I can afford another food supplement! This is not another supplement nor a medication, rather a deterrent to illness and an encouragement to wellness. I think of the herb dishes like my bird's little medicine cabinet. Contents for what ails them when they don't feel good! What kind of birds will eat your herbs? Everybody, from the tiniest finches to the largest parrots! Dove, quail, pigeon, even softbills eat Herb Salad™. When and how much should I give my birds? Herb Salad™ should be available to your birds at all times. It is best served in its own shallow dish so that your birds may *pick* around in it. Is Herb Salad™ the only supplement I need to give my birds besides cuttlebone? Don't stop using any supplements you are already using. 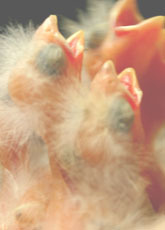 If your bird's diet is deficient in any areas, Twin Beaks® Aviary's Herb Salad™ will help correct this. How long can I keep my herbs before they're too old to feed to my birds? As long as you keep them dry and free of dust and debris, they will last as long as it takes for your birds to consume it, or up to two years. What differences in my birds will I notice after feeding them Herb Salad™? More active birds, better feather condition and color, better appetite, and increased breeding productivity are just some of the improvements from feed Herb Salad™. After we began feeding medicinal herbs to our birds, we had a dramatic reduction in deaths, illnesses, *mystery* fluffed birds, nervousness and feather/skin problems. The positive aspect has been that our birds are able to correct minor health issues before they get severe and we are able to notice a difference in their behavior. We rarely medicate. They are beautifully colored. My birds need to *fatten up*! Will this help? There are herbs in our mix that stimulate appetite. And, it stands to reason that a bird that feels well will eat better! Will my birds really eat licorice?! Yes, they will! In addition to its medicinal properties, licorice has a flavor that birds find appealing. It also helps to give some of the more bitter tasting herbs a better taste. I'm confused... Should I treat my sick birds with your herbs instead of medicines? No. Always seek veterinary care for sick bird. Usually, by the time you notice your bird's not feeling well, it's quite ill. Twin Beaks® Aviary's Herb Salad™ allows your bird to combat illnesses before the apparent signs that allert the bird keeper. Herb Salad™ will not cure disease, but it can aid in recovery and help to repair any deficiencies or damage done by the illness or the medications. Some of these herbs aren't indigenous to the country that my birds come from. Will they still eat it? How should I store unused Herb Salad™? You need to keep Herb Salad™ dry and away from moisture. Refrigeration and freezing are not necessary. Can you tell me how you keep your products out of area your birds are in? If I understand you correctly, you're concerned that our herbs that may have been exposed to our birds/bird room? Our business is in a totally separate building used exclusively for Herb Salad™. How do you dry your herbs and what prompted you to do this? Years ago, we grew many of the herbs ourselves, kept them in a cold cellar through the winter and dried them in dehydrators. Now, our herbs come directly from the growers and wild crafters. I became interested in animal self-medication in my desire to better understand why it was that wild birds, though subjected to adverse weather conditions, decreasing natural habitation, pollution, etc., were seemingly healthier than captive birds receiving supplements to their diet, medications, in controlled temperatures, etc. I got my salad mix yesterday and they immediately emptied the bowl but also placed it in their nest boxes. Is it o.k. to grind the herbs up enough so that they will not be desirable as nesting material? Some of the herbs repel mites, especially the pau d' arco bark (the brown strip-like pieces). We've had some birds do that, as well. It's not advised to grind up the herbs. This makes it difficult for birds to pick out certain herbs, plus, most birds will ignore powered foods. We allow the occasional birds who wish to, use the pau d' arco for their nests. It's repelling parasites such as mites. Wow, do you sell pau d' arco bark by itself? My birds have been scratching for months! We don't sell any of the herbs individually. Thyme, milk thistle, wormwood... all fight parasites and worms, as well. But, your birds should get enough of all these from Herb Salad™. Wood shavings are a natural insecticide, inhibit the growth of bacteria and repel parasites such as mites (avoid cedar and pine, though) One of the ingredients in our nesting material is aspen. It's much cheaper than pau d' arco bark. Do your birds have enough access to bathing? This could be a possible cause for the scratching, especially when humidity is low such as in the winter months. Can I add your herbs to my bird's seed? This may be a good way to introduce Herb Salad™ to your bird's diet, but over time I'd be concerned about waste. Be sure they're eating it all! My bird loves your herbs--though he's very selective. Herb Salad™ is working as it should with a selective bird; he's selecting the herb(s) he needs to address a particular need, e.g. deficiency, ailment, emotional. We recommend you add to his daily supply, mixing it in with the existing, so that he keeps getting what it is that he's seeking. My birds are just worn out from traveling from show to show this year and now it is almost breeding season for them. What testing has been done with doves? I have about 60 who could use a boost! Our own personal experience has been that our doves are every bit as enthusiastic about Herb Salad™ as our other birds. We are currently working with Cape doves, Diamonds, Green Wing and Ring Necks. We have many dove and pigeon-owning customers. Have you ever tried making a tea out of the Herb Salad™? We've had several people report success having made a tea out of Herb Salad™. A breeder friend of mine was doing that with her own flock. However, one of the main values and distinctions of Herb Salad™ and its recommended feeding guidelines is in allowing the bird to pick when, and what type of herb it needs. In tea form you're *force feeding*. Providing it as a stand-alone is our recommendation. I was wondering if the herbs have been known to heal (or help) a Gould that has been ill for a month or two. Is it recommended to feed the herbs to a seriously ill Gouldian that has been difficult to diagnose? It's been reported to me many times, as well as seeing it in my own aviary, that Herb Salad™ cured an ill bird when medication couldn't. There are several different reasons that make this possible� The bird's illness hasn't been correctly diagnosed, so proper medication isn't provided. The bird may be suffering multiple illnesses and the meds are only addressing part of the problem. Or, it could be that the medicines themselves are causing additional problems, side effects. Replenish Herb Salad™ often so that your bird doesn't run out of the particular herb(s) he needs. Keep trying to find the right medication.